The easiest Online Store solutions to sell & ship your music & merch. 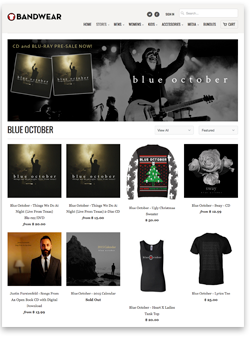 Or, we can build & manage your Online Store as part of our Bandwear Super Store along with day to day fulfillment. Bandwear Funding offers a better way to crowd-fund with online store e-commerce, merch/CD/vinyl manufacturing, and shipments to your fans, all under one umbrella. You can create and manage the store thru your own Shopify or Big Commerce account and just have us do the backend fulfillment. Offer Print-On-Demand products printed one at a time only after a customer’s order. No risk of cost to make physical inventory. Generate excitement with fans and collect up-front income by launching a Pre-Sale for an upcoming music project or merch item.